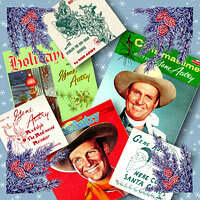 No doubt you’ve heard Gene Autry on the radio with his classic Christmas songs such as Up on the Housetop, Frosty the Snowman, Rudolph, the Red-Nosed Reindeer and Here Comes Santa Claus (Right Down Santa Claus Lane). But which one, according to ASCAP, was played on the radio 91,451 times between October 1st and December 14th of 2011? New York, NY , December 19, 2011: Nothing raises peoples' spirits - and inspires shoppers' zeal for finding the perfect gift - like holiday music . That's why radio stations around the country are eager to start playing America's most beloved holiday songs earlier and earlier each year. ASCAP (the American Society of Composers, Authors and Publishers) has just released its list of most-played songs of the holiday season. For the second year in a row, "Sleigh Ride" tops the list of songs, which were all written or co-written by members of ASCAP. "ASCAP is home to America's greatest songwriters and composers," says ASCAP President and Chairman Paul Williams." So it is no wonder that the top holiday songs have been written by our members. This list reflects the enduring power of music. It's a beautiful thing to realize that a songwriter's work lives on in such a way, bringing happiness and meaning to millions of people's lives year after year." Since October 1, 2011, "Sleigh Ride" has aired 154,327 times, making it the most-played holiday song on radio so far this holiday season. Although it depicts a wondrous winter scene, "Sleigh Ride" was written originally by Leroy Anderson on a hot summer day in 1946 in Woodbury, CT. Initially composed as an instrumental piece, The Boston Pops Orchestra gave the first performance in a concert conducted by Arthur Fiedler at Symphony Hall in Boston, May 4, 1948, and Mills Music published it that same year. The Boston Pops Orchestra recorded it in June of 1949. After Mitchell Parish added lyrics in 1949, it has been recorded by perhaps the most eclectic range of performers than any other piece in western music, with Leroy Anderson's recording the most popular instrumental version and The Ronettes' recording as the most popular vocal version. The top 10 most-played holiday songs so far this holiday season are listed below, all written or co-written by ASCAP songwriters and composers. Each song includes songwriter credits, and cites the most popular artist version played on radio to date. 3. "The Christmas Song (Chestnuts Roasting on an Open Fire)"
4. "Let It Snow! Let It Snow! Let It Snow!" 6. "It's The Most Wonderful Time Of The Year"
7. "Do You Hear What I Hear?" 8. "It's Beginning To Look A Lot Like Christmas"
9. "Rudolph The Red Nosed Reindeer"
Note: The list represents an aggregation of all different artist versions of each cited holiday song played on radio from 10/1/11 through 12/14/11. The holiday song data was tracked by radio airplay monitoring service, Mediaguide, from over 2,500 radio stations nationwide.